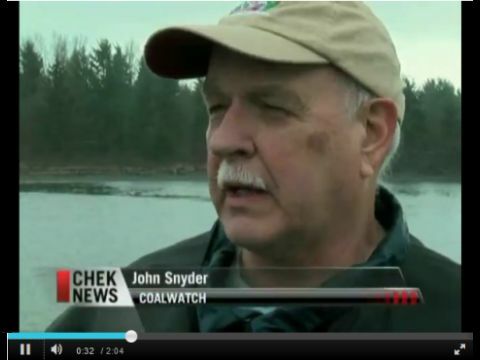 Host Gregor Craigie talks with CoalWatch President John Snyder about Compliance Coal Corp. withdrawing its application from the environmental assessment screening process. Click here to listen to the discussion. Click here to visit On the Island's website. VICTORIA – Compliance Energy, the proponent of the controversial Raven Coal Mine proposal, has withdrawn its revised application just hours before the BC Environmental Assessment Office (EAO) was set to announce whether or not the application would advance to final environmental review. A notice posted March 2, 2015 on the Environmental Assessment Ofﬁce (EAO) website indicates that Compliance Coal Corporation (Compliance) has withdrawn its Raven Coal Mine Project from the EAO screening/evaluation process. We received some misinformation that is circulating in some communities regarding the Raven Project and believe it is appropriate that we withdraw the project from the screening process at this time. We provide this letter as our notice to withdraw our three volume Addendum resubmission from the Environmental Application office forth with. Coal licence applications and existing coal tenures in the Valley comprise about a third of the regional district's total land area, according to research conducted by CoalWatch Comox Valley. Victoria, BC - Over the last decade the BC government embarked on a major law reform initiative to reduce the “regulatory burden” on industry. They reduced the size of the civil service and its role in resource management governance, which increased our dependence upon professionals employed by industry proponents to meet the public interest in natural resource management and environmental protection. This new report, prepared by Mark Haddock and supported with funding from the Law Foundation of BC, evaluates this regulatory approach, identifies issues and makes recommendations for improvement. A committee assembled to evaluate the Raven coal mine's current application to provincial regulators gave a scathing report on the proposed project to city council on Tuesday. Compliance Coal’s Raven Underground Coal Mine application presents neither a solid business case nor does it properly portray environmental risks posed to the Alberni Valley, said Jane Armstrong, member of the city’s select committee set up to provide input on the latest Raven Coal environmental review process. 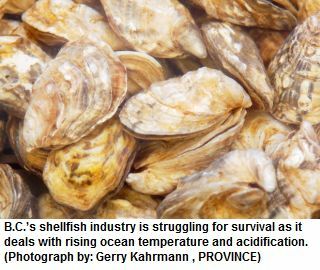 Despite insatiable demand, many are concerned B.C.’s once-thriving shellfish industry could be sinking. 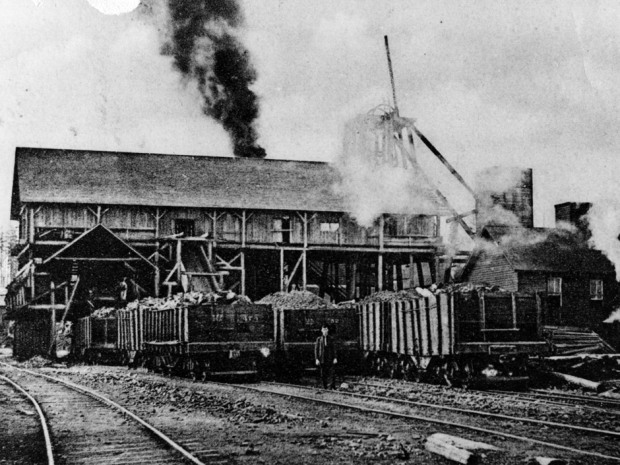 Cumberland, B.C., was built on coal — literally. Built in the 1890s atop one of the richest coalfields in coastal British Columbia, the ground below the village’s downtown is criss-crossed with hundreds of now-flooded mining tunnels. 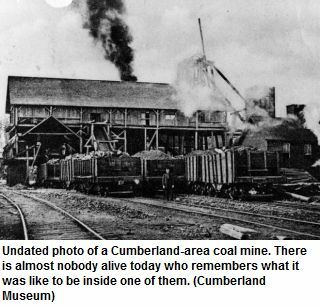 Recent research done by the CoalWatch Comox Valley Society has revealed that current coal license applications and existing coal tenures in the Comox Valley equal a staggering 33.6% of the total land area in the Comox Valley Regional District. 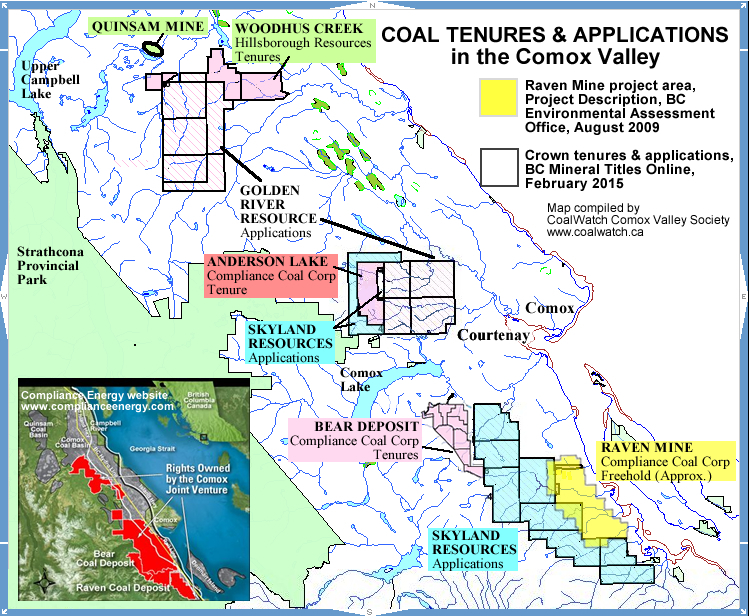 A staggering 33.6 per cent of the Comox Valley is currently covered by coal licence applications and existing coal tenures. Owners, like Compliance Energy, are poised to profit from Premier Clark’s coal mine and coal port expansion program that is pitched to create jobs and economic enhancement. 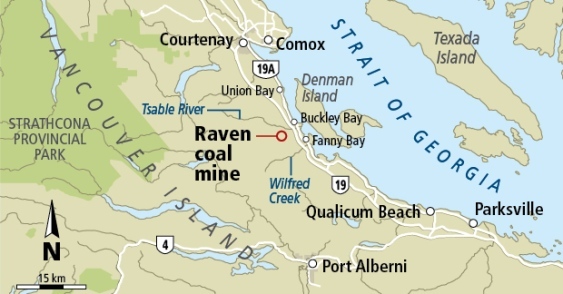 The proposed Raven Coal Mine near Fanny Bay faces an uphill battle. That’s the way it should be. The developers must prove that economic benefits outweigh environmental risks, and the provincial government must put the protection of B.C. and its people ahead of short-term profits. Despite growing opposition, Compliance Coal Corporation continues to pursue its Raven Underground Coal Mine Project near Fanny Bay. A provincial regulator's assessment of a mine that could bring three truckloads of coal to Port Alberni each hour is underway. Public input on the Raven Underground Coal Project is expected to begin in March if the application proceeds. The Compliance Coal Corporation put in a new application for the Raven Coal Mine in the Comox Valley. Mike Ruttan is the mayor of Port Alberni, one of the communities that will be affected by the mine. On The Island host Gregor Craigie talks with Mayor Ruttan about the impacts that the proposed mine will have on Port Alberni, its roads, harbour, air and residents. Note: In November 2014, Port Alberni residents, Maggie Paquet and Jane Armstrong argued that the Port Alberni council should establish an ad hoc committee to be made up of volunteer experts to advise city council and city manager Ken Watson during the 30-day screening of the application for an environmental assessment of the proposed Raven Underground Coal Project. Council agreed, and this news item lists the members of that ad hoc committee. A Vancouver company is once again seeking government approval for a coal mine near Buckley Bay, much to the dismay of environmental groups and shellfish growers in Baynes Sound. Compliance Energy has re-submitted its application for a coal mine less than 50 kilometres from downtown Qualicum Beach. CoalWatch Comox Valley Society has learned the BC Environmental Assessment Office (EAO) has received the latest Application for Environmental Certificate and Environmental Impact Statement (Application/EIS) from Compliance Coal Corporation for the proposed Raven Underground Coal Mine Project near Fanny Bay, BC. VANCOUVER — If the proposed Murray River coal project goes ahead, more than half of its employees would be temporary foreign workers in 2018 – potentially the first year of operation – and it would take nearly a decade for all the hourly jobs at the project to be filled by Canadians. Compliance Energy didn't get any coal for Christmas. Stephen Ellis, Compliance's CEO, said the company will not make its latest self-imposed deadline of Dec. 31 to get an application submitted to the B.C. Environmental Assessment Office (EAO) to open a controversial coal mine less than 50 kilometres from downtown Qualicum Beach. Asked when people can expect an application to be submitted, Ellis told The NEWS "early next year."